It appeared the grocery tenant in the rendering looked like a Harris Teeter. The intersection of Woodruff Road and South Carolina Highway 14 has not been a good location for supermarkets. Winn Dixie #1273, previously located in Maxwell Point, Greenville, South Carolina 29607-5934, closed in 2000 when Bi-Lo and Publix had locations both west and east of itself. Last edited by Carolina Knight; 01-23-2015 at 11:49 PM..
That's a big retail center, where the heck would they be putting it. Would it take over something else, because they said in the report near and across from graceland and I just don't see where. If the report says the proposed retail center is near and across Graceland East, it would have to be Maxwell Point. It is nearing 40 years. It is the same corner as Graceland and it is Harris Teeter The vacant property bordering Woodruff and 14 is not part of or owned by the cemetery apparently. The grocery tenant would occupy a 53,000 square feet space. The undisclosed service area will be for trucks making deliveries. 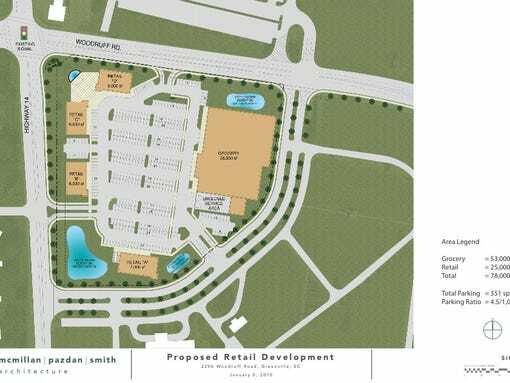 A main access road would separate the proposed retail development from Graceland East Memorial Gardens. The existing main access points into the cemetary from Woodruff Road and South Carolina Highway 14 would be removed. Harris Teeter at Lewis Plaza will be 60,000 square feet. Speculation of The Kroger Company possibly acquiring Bi-Lo Holdings is silent presently. Well not necessarily. There was an article in the Jacksonville, Fla. newspaper recently that strongly suggested that a Kroger acquisition of Bi-Lo/Winn Dixie was imminent. But you are correct they are being very secretive about it if a takeover is under consideration.